Detritus – the pieces that are left after something breaks or falls apart, what is leftover as a remnant, worthless material to be disposed of. Having more time on my hands than usual, I decided to tackle cleaning out a closet in the office. This is something that has been sorely needed for literally years. I stuff things in there and forget them, the detritus of past college classes, boxes of papers from my mother’s estate, pictures on faded film going back more than 40 years, packing boxes that might come in handy if I ever put the stuff on the other two shelves on eBay, gifts bought for coworkers that will now not be given, at least not until I have coworkers again. DH was home working on his computer on the day I decided to do the clean out. I picked that day in order to at least have some conversation as I pulled stuff out and littered the floor. So intent was I to get started, I didn’t take any pictures of the mess. How many jigsaw puzzles does one person need? I remember doing one at every Christmas holiday, the family gathering at the in-laws or our home for several days of visiting, eating, watching football and old movies, enjoying the holiday time. With 8 adults in one house for several days, a jigsaw puzzle was a way to get everyone involved in a come and go activity, something to do when one was just a bit bored. We almost always got the entire puzzle done. But the last time we had five adults in our NC home, and the puzzle was too difficult to finish. 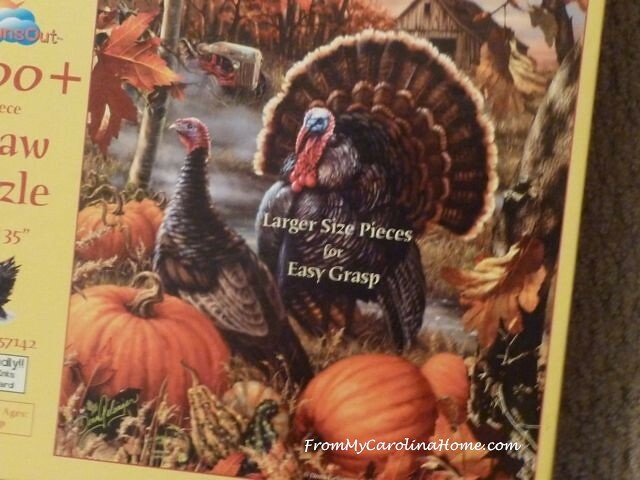 It was of turkeys and pumpkins that I bought for a Thanksgiving gathering, and it had 1000 pieces. I still have it, maybe I’ll try again, but my sense is that I will again get discouraged by its difficulty. You would think that ‘larger pieces’ wouldn’t be so hard. Puzzles are supposed to be fun, not stress producers, especially when there are houseguests. I put two in the donation box. What about these backgammon games that no one ever plays anymore, yet we have stored for years? I imagined playing on our veranda, reminiscent of a simpler time, when a cool evening can be passed with a simple game and a large glass of iced tea. At this point, I would have to look up the rules to remember how to play. OK, the smaller one can be donated, keep the larger. Maybe put it where I’ll think about it when the weather finally cools off instead of hiding in the closet again. I pull out a photograph of a sales meeting from 1986 or 87, or was it 88, with at least a hundred people all wearing the same polo shirt we got when we arrived. I remember the meeting place, a lovely hotel in Scottsdale Arizona. I remember the closer friends I had when I worked there. When the picture was taken, I could tell you the name of everyone in the photo, now I could barely name a half dozen. Why am I keeping this? I don’t know. I handed it to DH and said, look at this. Then I asked him, what should I do with it? I certainly don’t want to frame it and hang it on a wall. I don’t see keeping it at all. Should I put it back in the closet in its keeper cardboard folder? Then what? Let someone else shred it after I am gone? DH wordlessly held the picture over the shredder. I nodded. One piece of paper down, hundreds to go. Then, I tackled the shelf with my research for my Master’s thesis. I had kept every article photocopied for the basic reference support, drafts and diagrams, all my personal notes, and illustrations I made to advance a new theory. It filled one shelf and spilled over to another. I had successfully defended the thesis in oral argument in 2002, and was told by the three-professor committee that I should consider publishing it. Now, years later, all the research is hopelessly out of date, and I will finally admit that I will never publish this. I would need to start over on the whole concept and research – not something I want to do at this point in my life. The next shelf held magazines and illustrations I was keeping in case I ever taught a class, along with interesting photos of microscopic tissue and bacteria studies – things from before the internet. I started a box to go to the paper recycler. Then I filled a second box fairly quickly. Ever notice that once you start throwing things away, it gets easier to do more? Some things are current and records I have to keep. When I was done, all of that was down to half of one shelf. I remembered going through the same kinds of things at my mother’s home after she was gone. It took an entire day just to go through her cedar chest stuffed with unlabeled photographs of people no one in the family knew, letters and papers that meant nothing to me, along with every card I ever sent her, letters I wrote from camp, report cards and graded papers from years of school, pictures of me in dance costume, and a few things I’d rather forget. I wondered, is this the detritus of her life or mine? Maybe both. Having found mementos of my childhood, should I keep them, and then what? Keep them in the box somewhere for someone else to throw away years from now? Maybe I’ll go through it more carefully another time. For now, it isn’t taking up much room. OK, so this can be donated, and so can that. 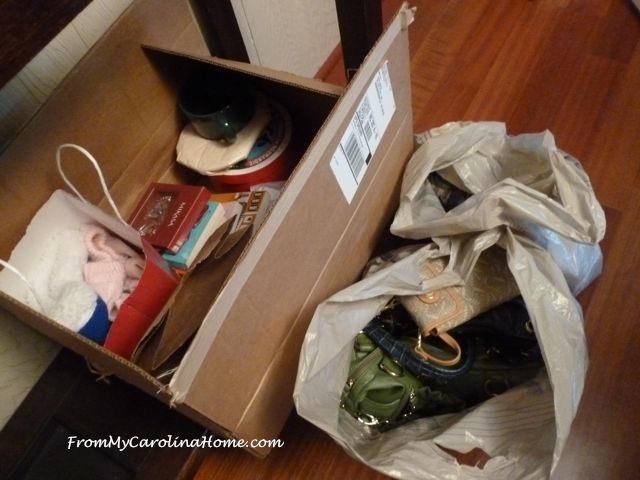 Boxes were brought in, filled up and set near the door to be taken to one of the many thrift stores in the area. Progress was being made slowly, as looking at all those papers was time consuming. 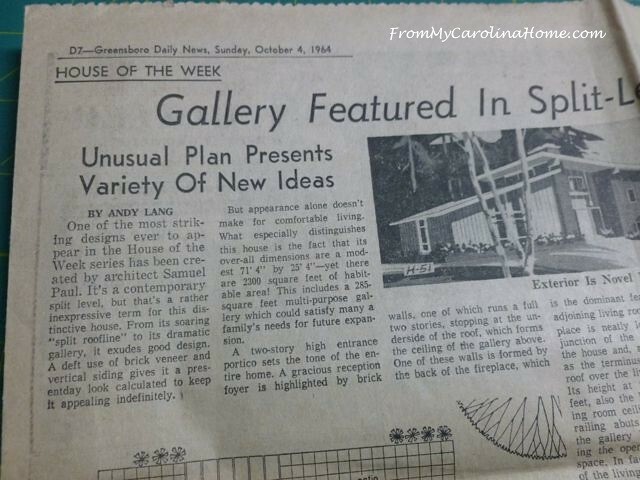 My mother had kept a newspaper page from 1964, and I have no idea why. Maybe she was interested in this house plan as she got her real estate license around that time. Do I need this now? No, I don’t. But it is over 50 years old, and there is a school lunch menu on the other side. It went back into the box with my childhood stuff. Our wedding album, almost 40 years old, falling apart with faded pictures, and still brings back wonderful memories. This of course is a keeper for me, as is my bridal album. Someone else can throw those away after I am gone. What is special to me now, will become detritus to someone else later. 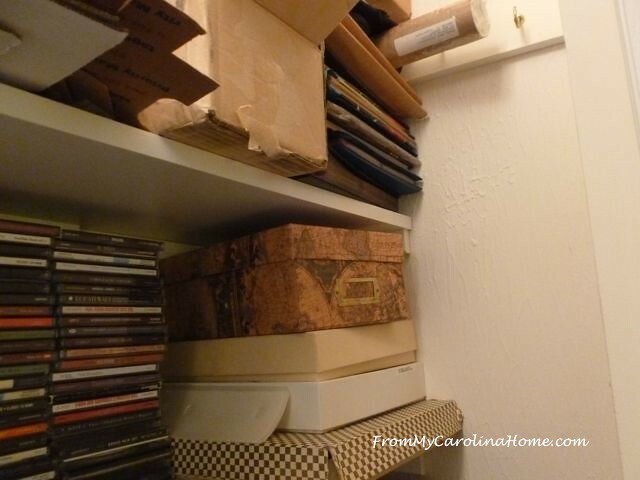 Another shelf holds several photograph albums along with shoe boxes full of photographs, remnants of days enjoyed at air shows, car shows, and vacations, holidays and special days. Do I remember all those days? Some, but not all. But when I was asked for a photo of a memory for my cousin, I managed to come up with one of her holding up a calendar, so we knew it was from Christmas 1979. Her daughter was still a toddler. Looking at some of those photos brings back fond memories of those days. But this was the first time in years that I have even thought about looking at them. At day’s end, six boxes and two bags cleared from the closet – two to the paper recycle, and rest to donate. Shelves are cleaned and reorganized. CDs sorted, organized by genre, and some pulled for donation. On another day I’ll see about all those photographs, maybe scanning the ones that seem important, and tossing some. 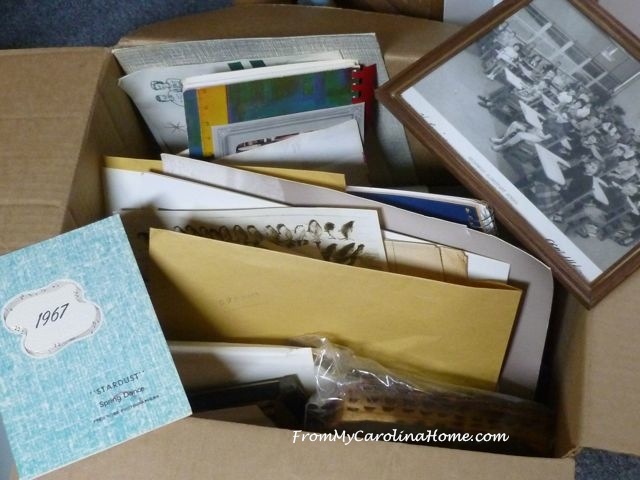 How about you, do you keep papers and other things long after they have outlived their usefulness? Do you have papers from your childhood still? When was the last time you looked at your old photographs? Our “vacation house” and all the contents burned to the ground last year. A rather harsh solution to clearing out. We had a lot of family papers and etc. in a trunk there. Looking back there are only a handful of things that I mourn losing. I’m not recommending house fires but one does learn what you can do without. Darla, we had a forest fire near us this summer that might have done the job for me, but we were fortunate. So sorry for the loss of your vactaion home! Thank you for reminding me that much of what I have held onto I don’t even remember packing away, nor will I miss it. Oh you are a productive one! Congratulations on clearing out so much stuff! I shudder to think of anybody going thru my stuff eventually – I enjoy my stuff! They would not! Every now & then I get a bee in my bonnet to de-clutter, but not often enough. At least once a year we have a community garage sale & I do purge a good bit then, both to donate & sell. 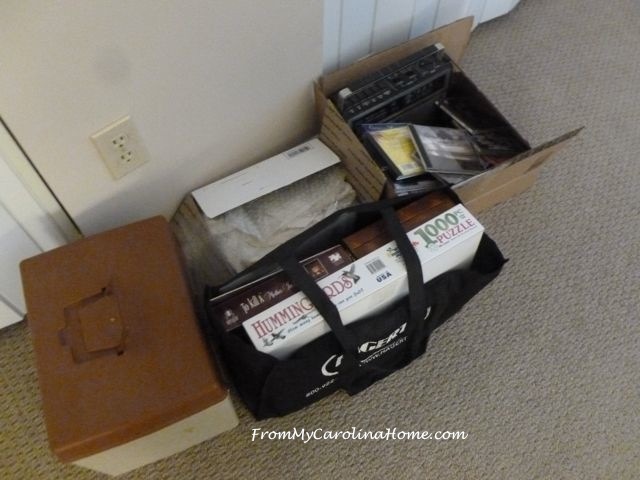 The last time we moved (twice in one year – ugh!) was 20 years ago! Had a garage sale @ old place, then again at new place, many miles away. And when I see your delightful tablescapes, I want to go to even more Goodwill or Garage Sales to pick up interesting dishes… poor hubby just despairs of my hobbies! (Recently I discovered 2 yellow & 2 white rectangle shaped basket-weave pattern plates adorable when we have Sunday evening “snack” suppers with corn in the summer.) Any job search nibbles yet? Good luck! I had to laugh at the backgammon game. Have one like that…..played it all the time in my twenties and now I too would have to look up the rules again to teach it to a grandkid. About 2 or 3 years ago I came home with a treasure…. a huge pile of old quilt magazines from the thrift shop. I pulled them out the other day, sat on the porch and went through them, decided that I was never going to make anything from them and these could go, along with a pile of old decorating mags, in to this week’s garbage collection. Great job on your clear-out! 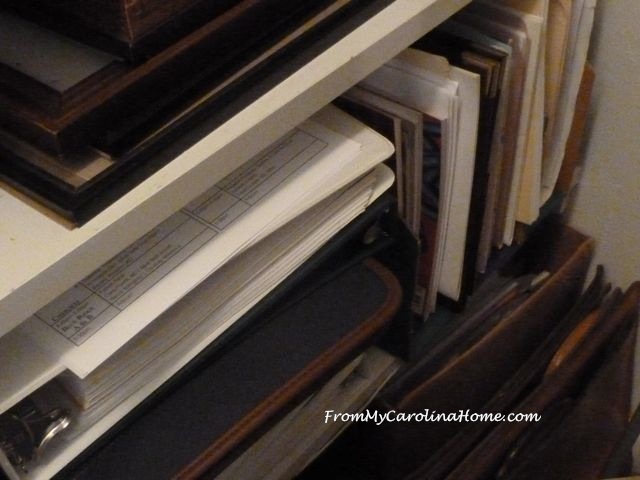 Having had 3 kids, my piles of paperwork and ‘stuff’ must stand about as tall as I am, with every homemade card, artwork project, report cards, pictures, bulletins, concert programs, school papers where my kids were mentioned, etc. Egads, I REALLY wouldn’t know where to start, though maybe putting them in separate piles for each ‘kid’ (now all in their 20’s) would be a start, instead of in one huge mixed up pile! And then there’s my stuff, from my youth, given to me from my mom. Sounds like a good winter project, going through all this ‘mess’. Good Morning Carole! Job well done. No, with my memory I do not keep very many papers, photos or well anything because in a very short time they mean nothing to me. I leave all of that to hubby and the remainder of my family. I have tried to talk my Mom and Dad into going through some of the items they have saved through the years and telling me and my Daughter who gets what but they refuse to. Thanks for sharing and have a fantastic creative day! pictures can be donated to a museum or the place nearest where it was taken. maybe someone passing through there would have the same memory but not the picture. my mom has already gone through her items and my fathers. She did a clean sweep when he passed away and moved in with us. Before having my children i would go through 1-2 boxes in the attic and pitch a ton of things. now i collect fabric and not much else. LOL! Hubby and I were just discussing this weekend our need to perform a major overhaul just like this! Hate to admit it but the subject was begun after a comment I made regarding a magazine page that has been hanging on my refrigerator for, catch this…. 25 years!!!! Shortly after we moved into our little home, I found a photo in Country Living (1991 issue) of what I wanted our kitchen to look like. Needless to say the picture still hangs and the kitchen still looks nothing like it! I know I should give up and toss it in the trash but it’s been there so long it’s become a permanent piece of artwork! Maybe I’ll have it framed:) LOL! I think you’ve touched a nerve with all of us. Who doesn’t have that drawer, that closet, that ROOM filled with now useless items? I have a box for each of my sons (now 53 and 46!) because I can’t bring myself to tossing their birthday cards, report cards, artwork, Mad magazines, games, etc from childhood. I’m sorry but THEY will have to do that. haha I’m pretty good about purging things other than clothing. Why do I have such a hard time with that? I also have awards and evaluations from my last job and I’ve been retired 15 years. I think I should just scan them and put them in a folder on my MAC. I’m brilliant!! Why haven’t I thought of that before?? LOL! As I read your post I felt the urge to either laugh or cry…not sure which! I spent several days last week doing the same thing! My biggest stash was scrapbook and card making “ideas”, articles, examples, etc. all neatly copied and hole punched and filed in multiple notebooks! Then there were the paper scraps and pieces! I moved on to photographs and just gave up. I know my children will have a conniption fit one of these days. I was taking and saving photographs long before digital came to be. That technology has just increased my hoard! Bottom line to my story is…I’m so glad that someone else has some of the same “issues” as I.
don’t have much to whittle down. But my downfall is pictures, We didn’t go digital until about 8 years ago so everything before that is in cardboard boxes and albums. That might be a good project for this winter when the wind blows and the snow piles up……. 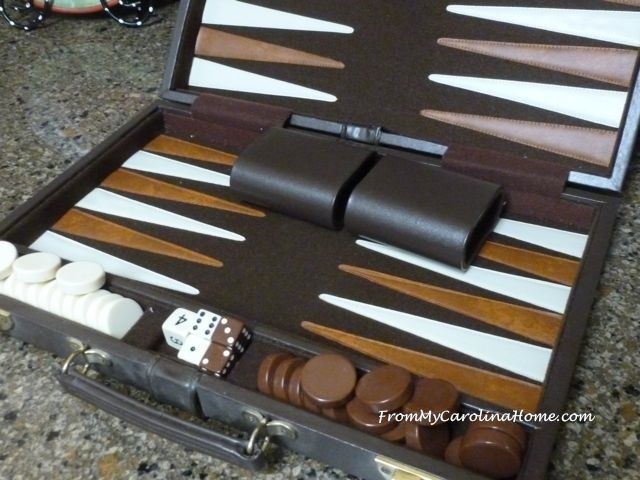 Hubby and I play backgammon all the time, with a large set much like yours that I got when I was in high school. He gets mad because I win most of the time. My downfall is crafts and keepsakes from my now adult kids school years. Oh well. I recently found a box full of my college math notebooks in my mom’s basement. I didn’t even know that I still had them. It was easy to get rid of them. There are also two boxes of elementary school projects from my kids in her basement. I was supposed to go through them this summer but it has to be done outside due to spiders and it has just been too hot. Puzzles never leave my house as we love to complete them over and over again. This was a great post. It has spurred me to look at my stuff once again. I have been on a purging and re-organizing binge since last year, going through every drawer, closet and every room in the house. I went through the whole house and now I am going through everything again because what I did not use since last year is going!! Thanks for stopping by! I only WISH I had family photographic evidence! I am always looking for photos of ancestors, and I find a few. I am writing a family history of sorts, just collecting stories and information, facts, photos when I can, to hand down to the future. I’d give anything if I had my mother’s wedding album, a catalog of childhood pictures, a picture of my grandmother at 20, etc., etc. I have very few, and it makes me sad. I’ve been writing down everything I can remember that my mother and aunt told me about their growing up, writing my own stories, just writing, writing, writing. I don’t keep paperwork, and meaningless things, though. It was like reading about myself when having a good clear-out. The more I clear, the easier it gets. It never ceases to amaze me what I’ve kept and have no idea why. As for old photos – I love looking through those as they usually bring back good memories. Yes, it does get easier throwing things out, or giving them away. Starting is the hardest. I find that after two or three culls, things get to a manageable level. All my photos are in albums – maybe once a year I’ll look through them, or if I’m looking for a particular photo, I pretty much know which album it will be in. My negatives, however are in several boxes. I can’t bring myself to throw them out, but I probably should. I did go through them several years ago, and had some printed – ones where the photos had deteriorated over time. Almost all of my old work related papers and books have long since gone – took several goes to do it, though. I haven’t been able to throw out any of the kids’ art works – a collection for each child, starting from about 18mths of age- or give them to the kids. I started scanning them, but never finished. Must have another go at scanning, then offer them to the kids – same as all their birthday cards and merit certificates, etc. Well done on on your clear out. It feels good, doesn’t it. Glue them together and hang them as pictures that she frames. Took some clothing to the thrift store this morning and will be gathering up a lot more as I’m trying to clean out my home as well. Good luck to us both on that chore. The puzzles will be welcome at your local cancer center or VA clinic, as the patients sit for a while in those places! Same thing with assisted living homes, I donated several to the cancer center where Mom went, and later to the assisted living where Dad spent his last days. I have a puzzle I bought a few years back just for the holidays, and now there’s no place to work on it… so it’s going. We all play rummikubes when we’re together, or crazy eights… my son continues that tradition, but with some of those Gen X games that are a mystery to me! A while back I came across some old board games in a closet and didn’t have the heart to throw them away. I know it has to be done sooner or later and without the kids knowing it. They think I should hold on to everything that they used to play with. Thanks for sharing your links with us this week at Celebrate Your Story. I need to do this. I sit here and think we do not have too much stuff. … well, three years ago it took weeeeeks to go through mom and dads things (and they are still alive) promising dad we would not throw anything away. I have a lot of their stuff here, like mom’s lace making books, guild books, materials, three boxes I think. My sister and I threw a ton of stuff out, boat loads. Anyway, yes, it is time consuming because you either just dump and not look, or you have to go through each thing. Very time consuming. Now is a good time to do it. I remind myself, there are people out there that want and need this stuff. My hubbs just made $300 selling old computers and cell phones on the nets. Wow. I am still so busy, so it is good to not look at the whole, just little areas at a time.